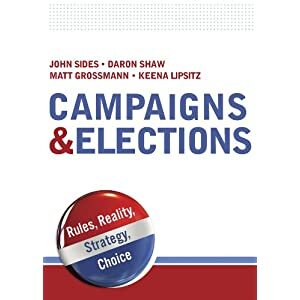 The Washington Post’s Dan Balz, Lynn Vavreck, and I will be discussing our respective books on the 2012 election—The Gamble and Collision 2012—today at in Nashville. Anyone is welcome to come. 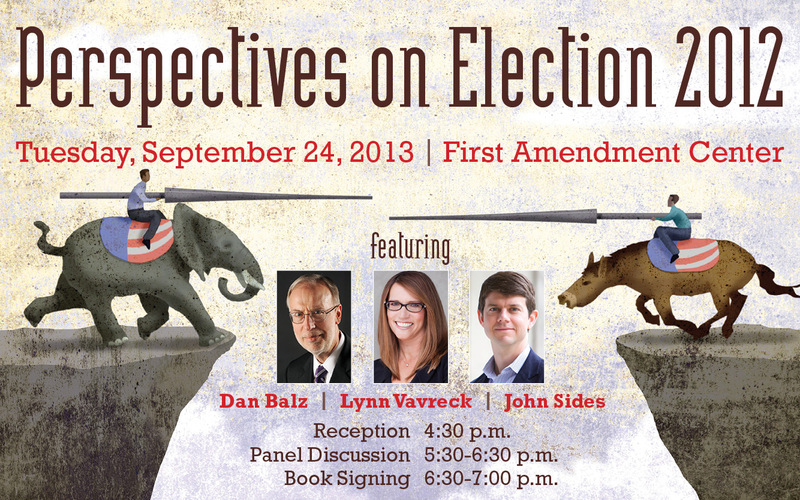 It’s at the First Amendment Center, starting with a 4:30 pm reception. The panel begins at 5:30 pm. A few weeks ago I ran a conference in Florence, Italy on Social Media and Political Participation. We had 12 people people present papers and probably somewhere between 60-80 people who attended presentations. However, in addition to simply holding the conference, we also live-streamed it over the internet and gave the conference a hashtag: #SMaPP_LPD. 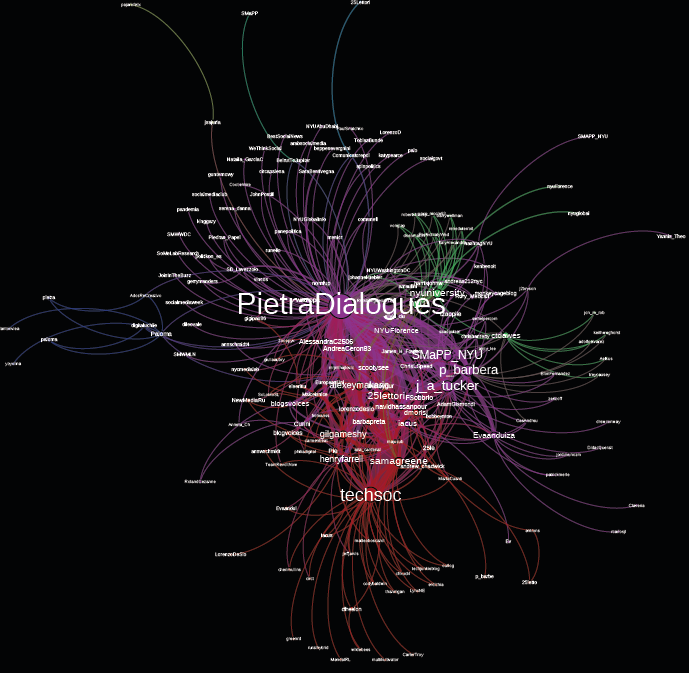 The figure above shows all the twitter accounts that tweeted using that hashtag (weighted by the number tweets they issued) and their connections to other people who tweeted about the conference. The benefits of live-streaming a conference in order to increase access to the conference are obvious: people who can not attend the conference can still watch the presentation. Our best guess is that we somewhere between doubled and tripled the number of people who could “attend” the conference, with over 130 people logging on to the feed on Friday and over 60 people doing so on Saturday. But the other great thing about live streaming is that not only can it extend your reach geographically, it can also do so temporally. So we’re in the process now of preparing a video archive of all the presentations (which will be up on the conference website shortly). We’ve already posted everyone’s presentation slides, so what this means is that shortly anyone will be able to download the slides for a presentation and then watch the video of the presentation whenever they like. But the other point I really want to make is how much I felt the use of the conference hashtag improved my own experience attending the conference. Throughout the two days of presentations, I was able to communicate with other people – both in Florence and watching over the live-stream – about the papers as they were being presented. I got to see what other people found interesting about presentations and you could communicate in real time about issues being raised by presenters. Moreover, I personally found that – far from being distracting – the fact that I was looking at the Twitter feed and tweeting kept me more engaged with the presentation. You all know the feeling: no matter how interesting a conference, by the 6th paper of the day everyone (especially if they are jet-lagged!) starts to zone out a bit and get sleepy. I found the hash-tag conversation to be an antidote to this common feeling; it kept me alert and more engaged with the paper presentation. Furthermore, by “summarizing” what I was thinking about papers in 140 characters, I think I was actually more quickly processing what I was learning than simply by listening. As the conference moderator, I was also able to take questions over Twitter, thus allowing people who weren’t in Florence to participate in the question and answer session in real time, which is kind of amazing if you stop to think about it. At a time when political science is increasingly coming under attack for not having enough to offer those outside academia, live-streaming and hash-tagging conferences seems a relatively simple way to make our research more accessible to a wider audience. And my experience is that this is a win-win situation: the same thing that allows more people access to our research can enhance our own conference experience, in addition to making it possible for us to “attend” more conferences beyond what our normal travel schedules/budgets would allow. So consider this post a plea to conference organizers everywhere: please think about live-streaming and setting up a hash-tag as a part of your conference in the future! Adding a hash-tag is costless. Yes, live-streaming costs money, but so do a lot of other things associated with conferences, and my sense is that the cost of live-streaming is falling and will continue to do so. In the long-run, if we can make live-streaming a regular part of conference (much the same way “conference dinners” are usually automatically included in any conference budget) I think the payoff will be more than worth it. Here is a video of the roundtable I mentioned previously, which attracted a big crowd at the Annual Meeting of the Midwest Political Science Association back in April. This was filmed with a Macbook positioned out in the audience, so the audio and video quality is not great. I apologize for that. But turn the volume up and you should be able to hear most everything. To orient you, here is the line-up from left to right: John Sides (moderator), Larry Bartels, Nate Silver, Ezra Klein, Simon Jackman, Lynn Vavreck, and Drew Linzer. The initial minute or so of the video—in which I introduced Larry—is cut off. The video begins with my introduction of Nate. This was a really fun and interesting conversation, and I thank all the panelists—and especially Nate and Ezra—for participating. Starting this year, the Academy is inviting Moynihan Prize recipients to deliver a major public policy address on a topic of their choosing. We are proud to announce that William Julius Wilson, the 2013 Moynihan Prize winner and Lewis P. and Linda L. Geyser University Professor at Harvard University will give the first such lecture. Wilson’s inaugural Daniel Patrick Moynihan Lecture will focus on the critical disconnect between the poor and gainful employment. Wilson argues that the changes in the structure of the U.S. labor market mainly hits people living in neighborhoods with weak institutional resources and holding jobs in the most vulnerable economic sectors. This is particularly true for disadvantaged black and Latino workers, because of these groups’ concentration in neighborhoods with insufficient infrastructures and enrollment in failing schools. The plight of these workers, says Wilson, calls for a comprehensive policy initiative that addresses all these problems and appreciates how they are inextricably connected. This sponsored by the American Academy for Political and Social Science, and will be held on May 9 at 3:30 at the National Press Club here in DC. More information here. Organized by AAPSS in collaboration with the Annie E Casey Foundation, the Russell Sage foundation, Sage publications and the NRC’s Committee on National Statistics, the briefing will review the state of survey research and its role in the federal statistical system, assess the nonresponse challenge and discuss alternate approaches for providing more reliable data at less cost. Douglas Massey, President of the AAPSS and Roger Tourangeau, Vice President of Westat, will provide a review of the state of survey research nationally and the nonresponse threat to survey validity. Then a panel of experts will discuss the implications of their presentation for federal, state and local policy and for business development. The panel includes Kenneth Prewitt, former director of the U.S. Census Bureau, Paul Emrath, National Association of Home Builders and David McMillen, formerly of the Census Bureau. Discussion will be moderated by Chicago Tribune columnist Clarence Page. More information here. And here is a report by the American Academy of Political and Social Science: The Nonresponse Challenge to Surveys and Statistics. In addition to Ezra Klein and Nate Silver, the line-up includes Larry Bartels, Simon Jackman, Drew Linzer, and Lynn Vavreck. Hope to see you there! That is the title of a panel at the upcoming meeting of the Midwest Political Science Association. It’s scheduled for Saturday at 4:35 in Chicago’s Palmer House Hilton. Participants include Arthur Lupia of the University of Michigan (and the former principal investigator of the federally funded American National Election Study), Susan Haire of the University of Georgia and Christopher Zorn of Penn State (both formerly with the National Science Foundation), Brian Humes of the National Science Foundation, and Rep. Daniel Lipinski (D-IL), himself a political scientist. Given what has come to pass with the Coburn amendment, I think this will be a very important conversation. Alas, this panel will conflict with the roundtable on the election that I mentioned, and thus I cannot attend. But I hope people will go and blog or tweet about what they hear. Relatedly, here is the AAUP statement on the Coburn amendment. Here is a new website—poliscinsf.com—created by an anonymous person. Here is a set of tweets with the hashtag #poliscinsf. Here is where the APSA is collecting information about individual scholars’ NSF awards. Here is where you can also tell APSA how NSF grants have influenced your teaching or professional development. Larry Bartels of Vanderbilt and a contributor here at The Monkey Cage. Drew Linzer of Emory, who created the forecasting model at Votamatic.org. Simon Jackman of Stanford, who was responsible for the forecasts at the Huffington Post’s Pollster. Lynn Vavreck of UCLA, with whom I’m co-authoring The Gamble. I’ll be moderating the discussion. The panel is scheduled for Saturday, April 13, at 4:35 pm in the Palmer House Hilton. Please come! Can partisan media contribute to healthy politics? On Monday at 5 pm, I’m participating in a South by Southwest panel entitled “How Partisan Media Contributes to Healthy Politics.” I prefer to think of this as a question: can partisan media contribute to healthy politics? For my contribution, I want to do two things. The first is report on the available social science to show that partisan media might not be as powerful as is sometimes suggested. I think that’s an important piece of context for this discussion. The second is to raise some questions about whether and how partisanship—an often maligned notion—can play a valuable role in democracy. The audience for partisan news is not as big as you might think. In the survey, almost a third of Americans believe they watch one of the three cable networks “regularly.” It’s not quite clear what “regularly” means, of course. This is one of the problems of using survey questions to measure media exposure. But if we assume that a regular viewer should watch at least an hour per week, then in reality only about 6-7% of Americas meet that description. And even those numbers may be too high, because they double-count anyone who watches more than one of those channels. The seemingly inconceivable possibility that someone might watch both Fox and MSNBC leads to the next point. Most people are news omnivores. Most people’s “diet” of news isn’t all that skewed by their partisans. 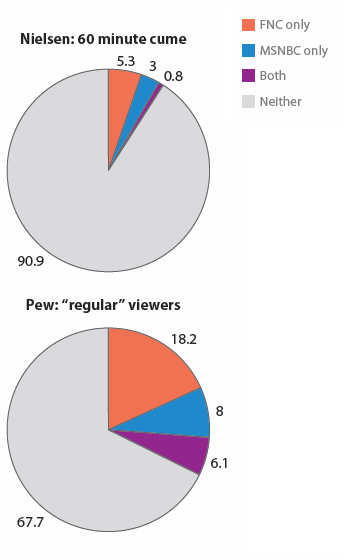 There is actually a lot of overlap viewers of various cable news networks. Markus Prior reports that people who watch at least 1 minute of Fox News each week devote about 7.5% of their news consumption to Fox but 3.7% to other cable news channels. The same is true of CNN viewers. This is consistent with the research of Michael LaCour, who tracked media usage via devices that participants carried with them and that regularly recorded the ambient sounds around them. It is also consistent with the research of Matthew Gentzkow and Jesse Shapiro, who examined news consumption on-line and found that most consumers read ideologically diverse new outlets. Unsurprisingly, if you isolate people who watch a lot of Fox News or a lot of MSNBC, their viewing habits reflect more skew. But this is a small group of people. The same is true of people who read political blogs: they are anything but omnivores, according to my research with Eric Lawrence and Henry Farrell, but they are also a small fraction of the public. Automatic tracking of television viewing using two different technologies reveals that most people avoid cable news almost entirely. A large segment watches cable news infrequently and nonselectively, mixing exposure to different cable news channels. In the small slice of heavy cable news viewers, however, partisan selective exposure is not uncommon. Partisan news may not polarize partisans, but attract polarized partisans. There is surprisingly little research that attempts to deal a fundamental issue. Do people who watch partisan news become more polarized, or do people with polarized views simply like to watch partisan news? In one experiment, political scientist Matthew Levendusky randomly assigned people to watch partisan news that either did or did not share their political outlook, or to a neutral news source. He found that partisan news that reinforced subjects’ political outlook made their attitudes modestly more extreme. This effect was stronger among those who said that they preferred to consume news that shared their political outlook—suggesting that even if the people who watch partisan news are already pretty partisan, partisan news will make them more so. However, other research by Kevin Arceneaux and Martin Johnson arrives at a different conclusion. They conducted a set of experiments and allowed people to choose whether they watched their side’s partisan news, the other side’s news, or entertainment programming that had no news content. They found that the news shows had no effects on attitudes as long as people were allowed to choose. This suggests that, in the real world, partisan news doesn’t polarize. If anything, it may be that polarization creates an audience for partisan news. A few experiments isn’t much of an evidentiary base. Much more needs to be done. But it’s worth noting that we don’t really know that partisan news is polarizing us, and with more evidence, we may find that it isn’t. As you can tell from the title of the panel, it was deliberately framed as a provocation. It’s sometimes (often? always?) hard to like partisan news and even partisanship itself. But here is the trade-off I want to emphasize. We want politics to involve calm, civil, rational deliberation about the common good. Partisanship doesn’t necessarily facilitate that goal and can actively detract from it. But we also want politics to be full of active, eager, and engaged citizens. Partisanship does a very good job of facilitating engagement. It’s one reason why voter turnout was so high in the late eighteenth century during the heyday of strong party organizations and a largely partisan press. I’m not suggesting that partisanship is an unalloyed good. Partisans can be misinformed if they are buying the spin their side is selling—spin that, by the way, they can usually hear in neutral news outlets doing “he said, she said” reporting, not simply in partisan news. Partisanship militates against other democratic goals, like tolerance for opposing points of view. Or compromise. And, in any case, we’ve only got an hour in this panel, so we’re hardly going to resolve this. I just think it’s worth exploring these tensions in the folk theories we have about politics. If you’re at South by Southwest, please drop by the panel! I’m joining Christina Bellantoni, the political editor of the PBS Newhour, and James Kirchick, a writer, blogger, and fellow at the Foundation for Defense of Democracies.